The best way to lose weight is without food cravings and emotional turmoil. Cravings for food are created psychologically and biologically. I have found research that says 97% of women and 68% of men experience food cravings. My experience as a weight loss coach tells me that 99% of the people who use a calorie restrictive diet will experience moderate to extreme food cravings. The more restrictive the diet, the more extreme the cravings. Everyone has cravings. I'm naturally thin and have never dieted to lose weight. Yet when I think to myself, "Wouldn't an ice cold Dr Pepper be good right now?" -- I get cravings. However, most researchers qualify a craving as an intensive desire for a certain food. Chocolate is the #1 craved food. Followed by other high calorie or salty foods. Research suggests there may be a relationship between cravings and drug addiction. Both are cravings and involve the same reward center of the brain. For instance, some foods contain ingredients that effect us PSYCHOLOGICALLY. Chocolate is an excellent example. While other foods, like soft drinks, can cause PHYSICAL cravings because chronic use destabilizes blood sugar. The more you drink, the more you want. Think of your blood sugar as a roller coaster. Peaks and valleys. NOT the best way to lose weight. Many of my clients suffered both. A psychological habituation for a food, eating the food was a habit. Plus a physical desire to eat for a number of reasons including blood sugar swings to actual hunger from skipping meals. Food cravings must be controlled if you ever hope to maintain ideal weight. Cravings cause such havoc with dieters, many experts are now telling people to anticipate cravings. Know what food you crave and why. They believe this knowledge will help a dieter stay on course. Even though I think this would be beneficial, it's not the answer to the craving problem. The diet itself is the real culprit. The cravings themselves are only the symptom of a much larger problem -- calorie restrictive, crave and cave diets. Cravings stopped being a problem for my clients when I adopted portion reduction as the best way to lose weight. In place of the less efficient, balanced diet make-over event that is universally recommended. I think dieting is pointless when you plan on living a naturally thin life. 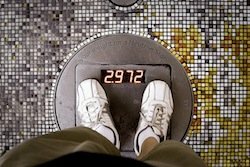 Why lose weight only to regain it? Doesn't make sense. Here's law #1 of living a naturally thin life. Your diet must be one you enjoy eating. A diet you can eat for the remainder of your life, that allows you to maintain ideal weight. If a diet causes cravings because preferred foods are now on a "can't have" list, your diet is doomed from the start. Study after study has proven it's only a matter of time before you return to your preferred foods. The best way to win a war is without a battle and the best way to lose weight is by not having a long list of "can't have" foods. I personally think it's insanity to expect anyone to change food preferences permanently. Overweight people that I know are not interested in perfect nutrition. They want to lose weight. Keep it off with as little suffering as possible. Food cravings are problematic with many origins or causes. I recommend beating the craving problem by eliminating it. You completely eliminate cravings by NOT outlawing a food. You simply eat less of it. Instead of a 16 ounce soft drink, order 12 ounces. Instead of large fries, order the small size. Give a friend a bite of your Snickers bar. Assume for a moment you eat these three things everyday. A McDonald's 16 ounce Coke (186 calories), McDonald's large fries (500 calories) and a Snickers bar (2.7 ounces, 280 calories). Now, replace those items with a 12 ounce Coke (save 46 calories), small fries (save 270 calories) and give a friend a bite of your Snickers bar (save 70 calories, about 25% of the candy bar). At the end of the day, you've saved 346 calories. Do that everyday for a year and lose 36 POUNDS! Lose 36 pounds in one year making three simple diet modifications. Now here's your question. Have you ever craved the bite of your candy bar you gave to a friend? Do you think you would crave that extra four ounces of Coke? Would you go hungry and feel deprived with 20 less french fries? I don't think so based on what my clients reported to me for the last 20 years. How can you suffer a food craving if you can eat the food you want and still lose weight? Isn't that really the best way to lose weight? Cravings for food is a major cause of diet failure. However, you create cravings by going on an eat this, not that diet. And in my experience, that's the real cause of food cravings not caused by natural hunger. It's not the best way to lose weight if it causes cravings. If you can't eat what you want, you will crave it. I guarantee it. Government agencies, associations, universities and the weight loss world is hell bent on shoving an unrealistic, yet idealistic nutritionally balanced diet down our throats whether we like it or not. After all, it's healthy and it's good for you. Better yet, it's politically correct. It doesn't seem to matter that this pollyanna, pie in the sky diet not only fails, it sends ravenous dieters to Binge City by expecting them to "stay motivated" and not give in to food cravings. The people who recommend this type of nonsense do not have real world experience or they would understand that a well balanced diet may work to improve health but it's a proven disaster as a viable weight loss strategy. Lose weight with non-intrusive portion control. After you reach ideal weight improve nutrition gradually. Think about it. Every diet you have tried caused food cravings. Did those cravings ever help you lose a single ounce? Or did they make weight loss miserable? Most food cravings are caused by unrealistic diets. You don't have to eat an extreme diet to lose weight and beat cravings. As a professional weight loss coach and consultant I have first hand experience controlling and eliminating cravings. My clients have had extraordinary success doing simple things that dramatically reduce food cravings. Here are a few of the most effective "craving stoppers" I've encountered. Choose a healthy diet plan that is not restrictive, requires self-deprivation or long term motivation to succeed. Eat breakfast everyday. Don't eat breakfast and you are 400% more likely to be overweight than those that do. Why? Food cravings. Don't eat breakfast and you overcompensate the entire day. I have seen research stating people who don't eat breakfast consume approximately 250-500 extra calories per day. It's simple. Eat breakfast and stabilize your blood sugar. Breakfast beats cravings cold. See my 28 Day Diet Diary on this site for examples of a quality breakfast. My clients who complained the most about food cravings were the same people who ate a fiberLESS diet. When you increase fiber intake something magical happens. Food cravings, or the majority of them, disappear. Fiber is the all time, #1 craving killer. Living a naturally thin life at your ideal weight is your right. That's what was intended at your birth. However, if you wish to spend the remainder of your life getting on and off the diet wagon, I know of no better way than to spend your life on a starve, crave and cave diet. It's called the diet merry-go-round. If you're tired of being overweight and you hate the thought of more food cravings and diet misery, I have good news for you. Improve the nutritional value of your diet after reaching your ideal weight. Improving nutrition is much easier when excessive weight is no longer an issue in your life. You improve nutrition to improve health, not to lose weight. Improving nutrition as a weight loss strategy fails because the drastic change in the content of your diet and restriction of preferred foods causes food cravings. Followed by emotional turmoil, binging and eventual diet failure. Restrictive diets ignore their own pitiful success rates. The diet is perfect. The flaw is in you. Now, stay motivated so you can fight off the food cravings, pain and misery this masterpiece of nutritional perfection will cause. I'm being sarcastic of course, but it's 100% true. Dieting causes cravings. And the best way to lose weight is without food cravings. Cravings, deprivation, hunger and emotional turmoil eliminate any real possibility of lasting weight loss success. That's the real reason "diets don't work." Frankly what determines the best way to lose weight isn't the same for everyone. That's why portion control works. Each dieter simply reduces portions of their current diet and preferred foods. No one is forced to eat someone else's idea of tasty, satisfying and good. There will be plenty of time to improve the nutritional quality of your diet after you reach ideal body weight. And that's the absolute best way to lose weight in my opinion.